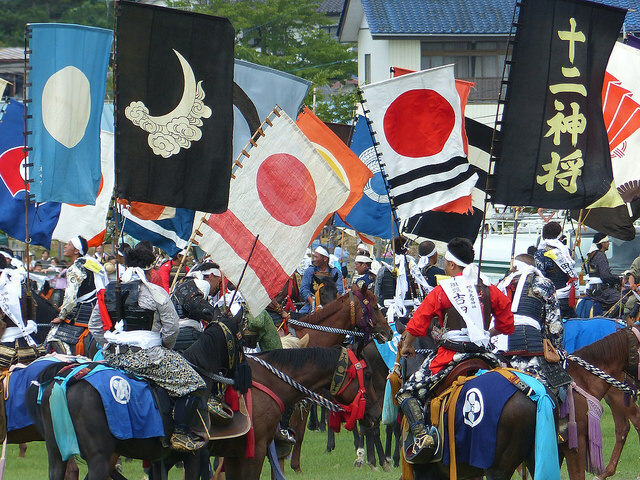 Japan’s samurai caste may have been abolished in 1869, but no one seems to have told the Soma Clan – their samurai continue to hold a thousand-year-old military tournament every year. Over 400 mounted warriors take part in the three-day-long event. It’s a unique chance to see an ancient rehearsal for war. While the Nomaoi dates from the tenth century, it’s only been held at its present location since 1323, when the Soma Clan took up residence in the area. It takes place at multiple venues in the town of Minami-Soma and the surrounding area. It’s organized by three shrines that each embody the guardian deity of the Soma Clan, and is led by a supreme commander who can trace his ancestry to the clan’s founder, over a thousand years ago. The festival begins on a Saturday morning in late July. 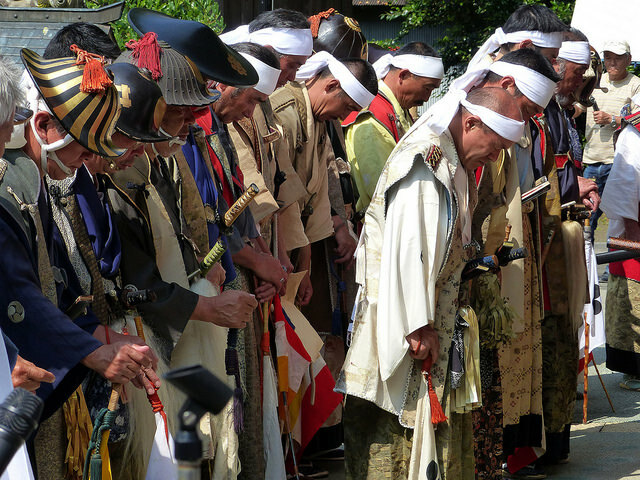 A solemn ceremony is held at each shrine: first prayers are said for continued success in battle, ceremonial sake is drunk, and the samurai kneel before their commanders. This is a really good chance to see the warriors close-up. They dress just as they always have – colourful armour and elaborate helmets – battle equipment that has been passed down over the generations. When a conch shell is blown, they mount their horses and begin to depart. All three parties march to the hippodrome, where the main events will be held. They proudly bear banners declaring their rank and the team they belong to, and are accompanied by attendants on foot carrying yet more banners. You could be forgiven for thinking you’d stepped back in time and were seeing an army heading off for battle. After the hippodrome is ritually purified, the first competition of the tournament begins: 12 races once around the track, each with 8 riders. These riders are dressed not in battle gear, but in traditional tabards and headbands, but it’s just as much an interesting and historically-authentic sight. These races mark the end of the first day of the festival – generally considered only a warm-up for the main event. 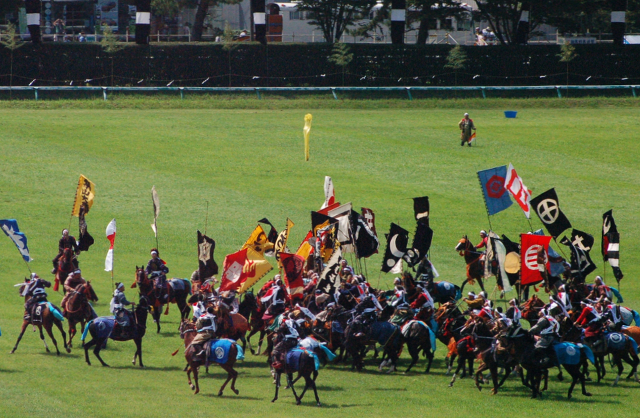 Day two (Sunday) begins at 9:30am with a procession of over 400 horsemen in full battle-dress. 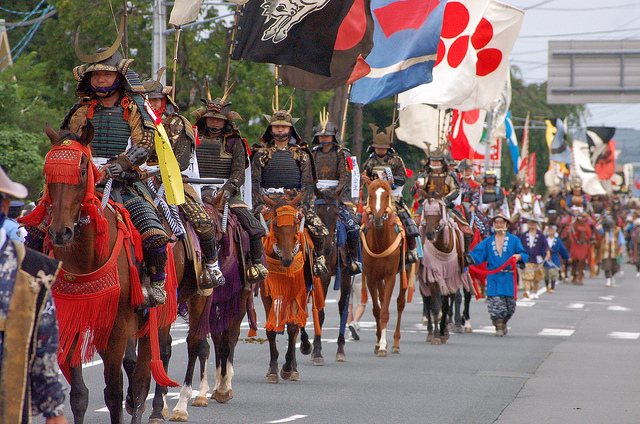 They march from the north end of Minami-Soma along a three-kilometre long route, ending up at the hippodrome. The groups from each shrine march together, following a hand-held mini-version of their respective shrine, and around 60,000 people line the streets to watch. The ages of the samurai range from the elderly right down to young children. They’re mainly male, but a few women do take part. Samurai may have a reputation as fearsome and ruthless warriors, but their descendents seem to have softened a bit – the parade has a friendly and informal atmosphere – but one that still has echoes of the valiant and majestic warriors of old. 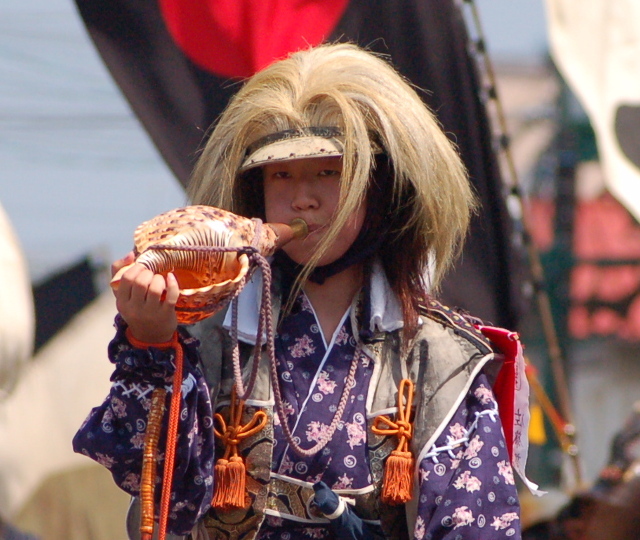 The blasting of conch horns and the beating of drums helps to build the feudal ambience. You’ll often hear conch horns like this one, sometimes accompanied by drumming. 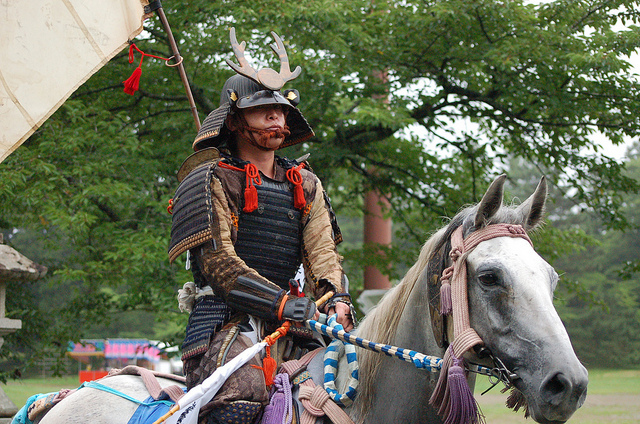 At noon, another round of horse races begins, but this time the samurai race in full armour and carry swords. We get to see exactly what samurai looked like when charging into battle – but thankfully without the risk of being killed. The riders do take off their helmets, but they race with their all their other kit – even their ancestral banners streaming behind them – I guess there’s not much point in winning if no-one knows who you are. There are ten races with ten horses, each going once around the hippodrome. Once the start is signalled with the blowing of a conch horn and the beating of battle drums, the horses thunder along at full gallop – their riders desperate to bring home some honour. 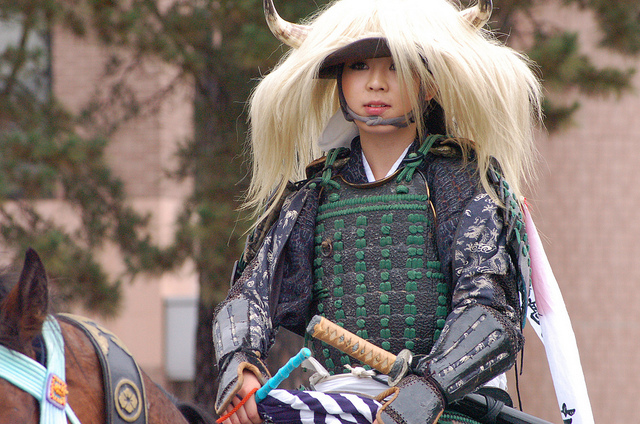 Samurai of all ages take part in Nomaoi, but this must be one of the youngest. Once the races are complete, it’s time to begin what many consider the climax of the festival – the flag capture. Hundreds of samurai spread out across the hippodrome, and on a signal from a conch horn atop the hill, sacred flags are shot high into the air on firework rockets. As they drift slowly down, the horsemen scramble to catch them. The sight is said to resemble a mediaeval battlefield, but I suspect that the absence of blood, guts and dismembered limbs makes it a whole lot more pleasant. The proud horsemen who capture the flags race up the hill, allowing the crowd to see who has won. This event is watched by over 40,000 people, and marks the end of the main tournament. These samurai are fighting for the honour of catching the yellow flag. To minimise casualties, they keep their swords sheathed, but they do brandish their riding crops. The final part of the Nomaoi is held on Monday morning, about 8km away at Odaka Jinja Shrine. While it’s on a much smaller scale than the previous day’s events, it has the closest ties to the origin of the festival, and is well worth seeing. 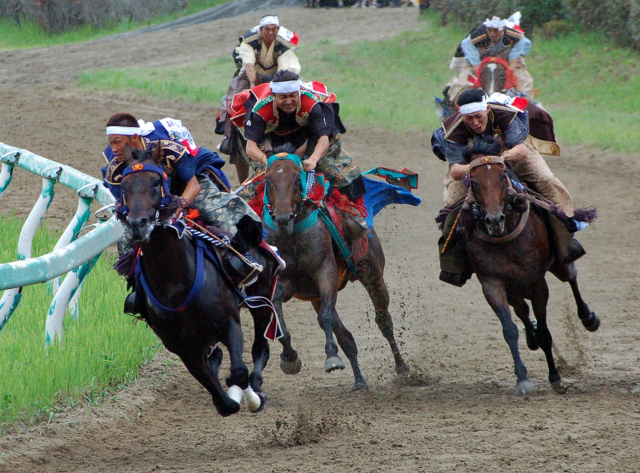 Nomaoi literally means ‘wild horse chase’, and that is just what goes on at the shrine. Over a thousand years ago, Taira no Kojiro Masakado, the semi-legendary founder of the Soma Clan, tested his army by releasing wild horses and challenging his cavalry to capture them. Nowadays the event is held within a corral set up in the grounds of the shrine. Samurai herd horses into the corral, and men on foot dressed in white try to capture them with their bare hands. Working together as a team, they eventually manage to attach rope bridles to the horses, which are then presented to the shrine as offerings. One reason Nomaoi really stands out is because you don’t tend to see a lot of horses in Japan (unless you go to the races) – there just isn’t the space for them. 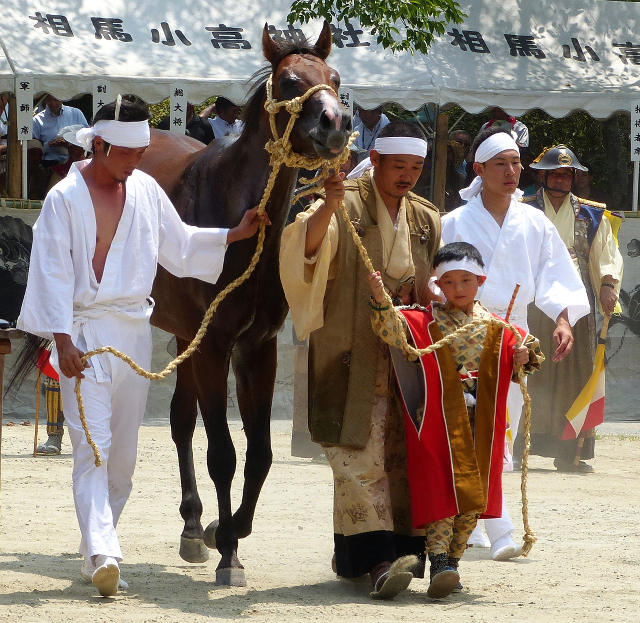 The Soma Clan is able to muster so many horses only because the area is a major centre for horse-breeding, and on the days of the festival you can see small groups of horses setting out from all over town. But while the samurai may be true to ancient traditions, the horses are not – the small Japanese breeds of feudal times are now rare. 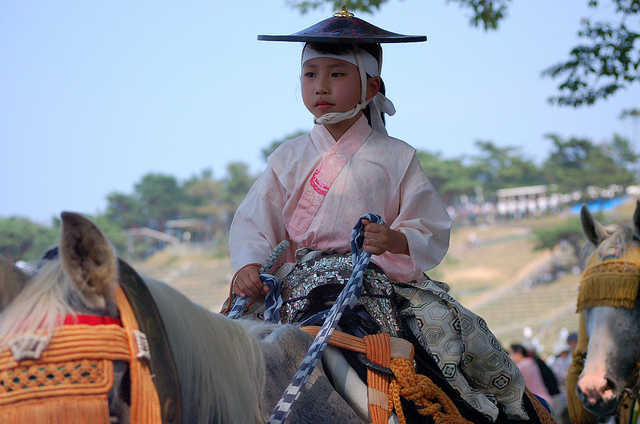 The horses you will see at Nomaoi are Arabians or other breeds from overseas. Minami-Soma is one of the towns that was worst hit by the Tsunami in March 2011, with large parts of the town swamped and many people killed. If that wasn’t bad enough, Fukushima Daiichi Nuclear Power Plant is only 25 kilometres away. Parts of Minami-Soma remain subject to evacuation orders, but despite these obstacles, the Nomaoi went ahead even in 2011, albeit on a reduced scale. It has now recovered almost to its size from before the disaster, and serves as an important focus for a community that has suffered so much in recent years. A horse that has been captured in the wild horse chase that takes place on the third day of the festival. Now for some practical advice. Japan in July is hot. Very hot. And humid. And hot. There’s very little shade up on the hillside above the field, so come well prepared, and be glad you’re neither an armour-wearing samurai or a galloping horse. The hippodrome (Hibarigahara Field) is 2km from JR Haranomachi Station – but there’s a special shuttle bus that operates during the festival. It takes about 3½ hours to reach to Haranomachi Station from Tokyo, or about 2 hours from Sendai. Very unusually for Japan, if you decide to come by car, there’s free parking on offer. Every samurai carries one (or sometimes two) banners declaring his team and rank. If you want to see the Shinto ceremonies that precede the main festival, you’ll have to head to one of the three shrines where they take place. Soma Nakamura Jinja is 22km north of the hippodrome and 2km from Soma Station. Soma Ohta Jinja is 2 km south of the hippodrome, and 2½km from Iwaki Ota Station. Finally, Soma Odaka Jinja (where the wild horse chase itself takes place) is 8½km south of the hippodrome and 1km from Odaka Station. All these stations are on the JR Joban Line. For day two of the festival (Sunday), you need to purchase tickets for access to the viewing area. They’re ¥800 in advance or ¥1000 on the day (free for children), go on sale from early June, and can be purchased from convenience stores across Japan. More details (in Japanese) can be found on the official website, which also gives the exact dates of each year’s festival. Alternatively, you can call the festival organizers on 0244-22-3064. If you can’t make the festival, a small consolation might be the permanent Nomaoi exhibition at Minami-Soma Museum, close by the hippodrome.